What is a New Hampshire Promissory Note? New Hampshire Promissory Note: What Is It? A New Hampshire promissory note is a written agreement between the borrower and lender. A co-signer may also be a party to the agreement. The note may be secured or unsecured. The secured note means that there is a piece of collateral that may be collected if the borrower does not comply with the agreement. A car loan is an example of a secured promissory note. If the borrower does not repay the loan or if they do not comply with e terms of the agreement, the lender would repossess the vehicle. The vehicle acts as collateral. An unsecured New Hampshire promissory note does not include collateral. New Hampshire promissory notes must comply both with contract law and, in certain instances, securities law. What Is the Maximum Interest That May Be Charged? The maximum interest rate that may be charged in New Hampshire is 10% unless another interest rate is agreed upon in writing by the parties. The date that the promissory note was created. This date, as well as the date listed for the signatures, is used to help verify that the parties entered into the agreement together. The dates also help determine the amount of time that a party to the agreement has to approach the court for help or for the lender to get involved in collections activities. The dates in the agreement should be formatted as month, day, and year. The identity for each person and their role within the agreement. This is the legal name of the person or entity and their role within the agreement. Parties include the lender, borrower, and, if needed, a cosigner. For example, Susan Jones, Co-Signer. The mailing address for each party. The mailing address should be listed for each party. If the promissory note is secured, the physical address for the borrower and any co-signer should be listed if it is different from the mailing address. This can help locate collateral if necessary. If the lender has a separate payment address, the payment address should be documented in the part of the New Hampshire promissory note that addresses repayment of the loan. The amount loaned to the borrower. This is the principal amount. It does not include interest charged for the loan. Before this document is executed, it is important to review this amount to ensure it is correct. The amount of yearly interest charged. Remember, if an interest rate is not specified, the lender may not charge more than 10%. However, if an interest rate is mentioned in writing, it can be any amount. Payment agreement. This is how the loan gets repaid. It must list how many payments (installments), the amount of each payment, and the due date for each payment. If there is a late fee, the amount should be documented as well as when it will be assessed. If the New Hampshire promissory note is secured, it should include a good description of the collateral. Without a description, a legal disagreement could cause the court to hold that the promissory note is unsecured. Interest Due in the Event of Default. This is the amount of interest that the borrower is responsible to pay if they do not comply with the terms and conditions of the promissory note. It is higher than the initially agreed upon and documented interest rate. Payment Allocation. This explains how payments made by the borrower are split between the principal balance and the interest rate. Prepayment. Whether the borrower will be financially penalized for wanting to pay off the loan early. Acceleration. Acceleration is the lender’s right to demand payment in full for the remaining balance of the loan if the borrower does not comply with the terms of the agreement. Attorney Fees and Costs. If the parties have a legal disagreement over the New Hampshire promissory note, this clause is used to explain how attorney fees and costs will be handled for each party. Waiver of Presentments. The lender has no legal requirement to be present when the borrower makes payments. Severability. 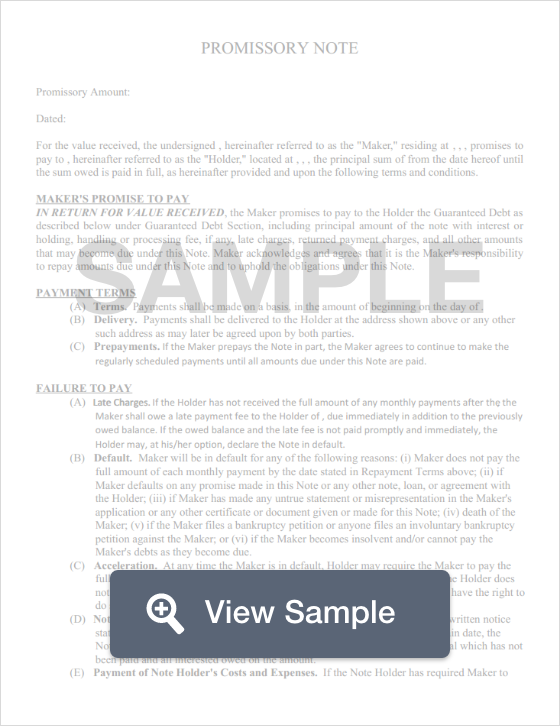 If part of the promissory note is found to be invalid, the remainder of the note is still valid. Notice. Whether the lender will provide the borrower with notice if the lender will sue the borrower for default. Governing Law. The state whose laws will be consulted if there is a legal dispute related to the New Hampshire promissory note. While there is no law requiring New Hampshire promissory notes to be notarized, it can be done to help verify that the signatures are legitimate. Only the borrower and co-signer need to sign the agreement.